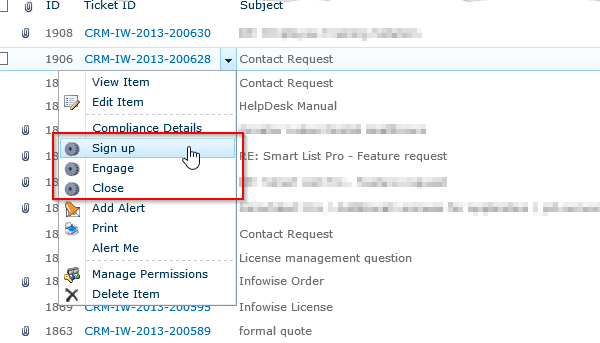 We are pleased to announced that a new feature has been added to Smart Action Pro. Until now you were able to run actions in response to events (such as item being updated), based on timer (such as one year after item being created) or by clicking on an execution column. Now, you can also do it by using context menus and ribbons. When you set your action to be viewed as a column (under Advanced settings), a new execution column is added to your list. Clicking this column executes the action. But sometimes you do not wish to display this column in a view or want to execute the same action on more than one list item at a time. 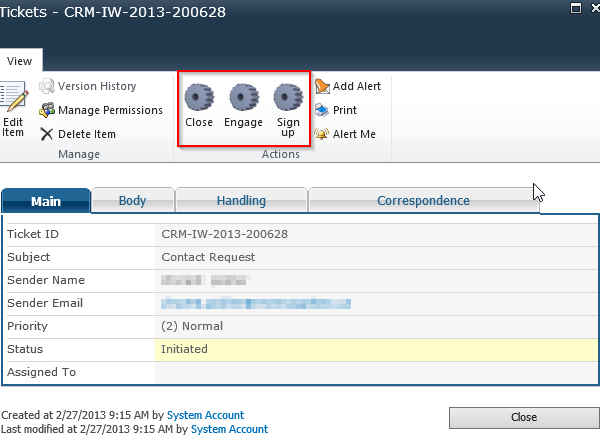 Let's see some examples (based on our actual internal CRM system developed using our products). Here you can see 3 actions in the context menu. They are used to sign the user up for our newsletter, engaging the ticket (settings is Assigned to field to the current user and setting the Status to Engaged) and closing the ticket (setting the Status to Completed). 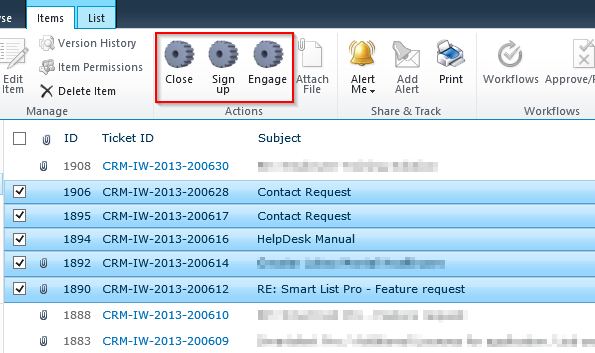 The same 3 actions are also available in display and edit forms. By selecting one or more tickets in any view (using the checkboxes on the left), you can run the action on all of them at once, for instance, assigning multiple tickets to yourself. Note: the new feature is only available in SharePoint 2010 or 2013.